Sometimes you need to listen to what is happening around you, and in the last two weeks I have almost lost count of the events I have been to where the content or the speaker has been focussed on sharing one thing – how to perfect your elevator, 1 minute and 2 minutes pitches. And my response has ranged from fist pumping NAILED IT!!! to seriously???? c.	We get what we focus on; focus on what you are good or even GREAT at and speak to that; don’t make the most memorable thing about you how good I thought you were at speaking (not what you actually do) compared to what I was expecting after you apologised. 3. I am getting loaded up with too many options in too short a timeframe. 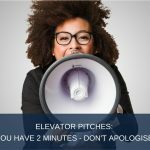 You have 30 seconds, 1 minute, 2 minutes in an elevator pitch. Don’t confuse me. Find the ONE thing that will make the most impact. Design one message around that one thing, and remember even when on a stage in front of thousands, the most successful pitches and presentations are delivered one conversation to one person. Every time. 4. Find the unique lens. For example, David has a fabulous marketing automation business. But in his previous life he was an engineer and although he touched on that in his 2 minutes of fame, he could really position that to not just stand out from the crowd, but to give potential customers the one thing they all want – a sense of safety and security and it’s okay to invest with David – because engineers are process driven, curious, determined to make things work, and when things break they know how to fix them. 5. Only be funny if you are genuinely funny, if it is how you are when you are having a glass of wine with your girlfriends, a beer at the bar, or after a run with your mates. Don’t script funny; don’t script jokes; don’t follow the (very old) mantra of you have to get them to laugh in the first few moments – unless that is how you show up in your everyday world. Otherwise, unconsciously all I know is I’m hearing a script and I am wondering what else is just a script, and where the real you sits. But perhaps the most important thing I can share with you is this. Just be you in your elevator pitch. Nervous, confident, experienced, or inexperienced. None of that matters if I can feel your passion, your knowledge, or your joy in what you do for people just like me.